Here's the small sand blaster that I use in the Mustang restoration. It's called a Speed Blaster. If you've been following the progress of my 1965 Mustang restoration, you've already seen that it's great for both small and medium paint removal projects. And for removing rust from old car parts. It's one of these things, that for years I thought of buying. But I'd just assumed they were too expensive so I didn't even bother to check them out. The Small Sand Blaster - Cheap and it Works ? A while back, I took a trip down to a friend's shop, to look at his Mustang Restomod project, and what I saw, finally convinced me that It was time to have my own. I was admiring his freshly media blasted front valance, and moaning, about how for years, I'd wanted my own sand blaster, but they were just too expensive. He says "You know, you don't have to spend over a hundred bucks any more, to get a sandblaster that easily does jobs like this." "And all you need is a small compressor to run it." That's a good thing, because my little home air compressor was chosen strictly to run an air sander, some other small air tools and because it was cheap. Sure, a big compressor would have been nice, but for the amount of times I need a lot of air, I just can't justify the cost. Maybe if there was a sale.... hmmm. It's amazing what this small sand blaster can do on common restoration jobs, like removing rust and old undercoating from body panels or inner fender wells. For cleaning up and restoring cast iron exhaust manifolds to tackling to reach areas that need paint or rust removed, this little sand blaster is just awesome. It's also foolproof. You just open the lid on the top of the blaster, pour in some sandblasting sand or any other blasting media and screw on the lid. There's a little lever on the side that turns the flow of sand on or off. When it's parallel, the sand is on. When its vertical it's turned off. Then grab some safety glasses, a dust mask. Snap it onto the air hose and have some fun! Even if you only need to do some minor rust removal, say on a fender lip, or wheel well, it just makes things so easy. Why I didn't get one of these years ago, I just don't know. Here's my 13 year old son removing surface rust and old paint on the 1965 Mustang coupe with the gravity feed Speed Blaster. It didn't take him long to do this while I worked on another part of the car. 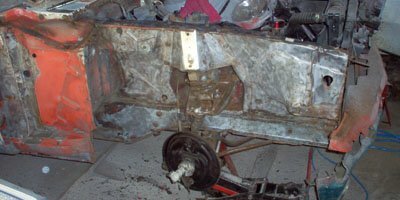 He quickly removed all the surface rust and paint on the Mustang radiator support. Not bad for his first job! Here' a shot from the Mustang inner fender restoration, which was then followed up with an 80 grit wheel on the sander. 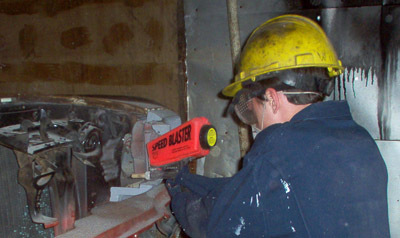 Whether you're doing a small rust repair or stripping paint to do body work, this little blaster is the way to go. 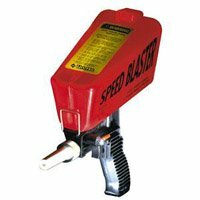 You can use the Speed Blaster with sandblasting sand or any other media. It's a great way to turn tedious jobs into quick simple ones. Need one for your project? Here's some information on where you can get your own small gravity feed sandblaster.